Alexa is a Registered Clinical Counsellor (RCC #13309) who specializes in treating relationship issues, stress and anxiety, depression, trauma, and low self-esteem. She also has experience working with life transitions, anger management, loss and disordered eating. Alexa received her undergraduate degree in Psychology at the University of British Columbia, and her Master’s of Arts in Counselling Psychology from Adler University. 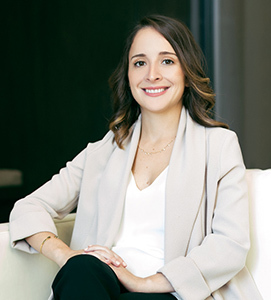 Before transitioning to private practice, Alexa worked for a non-profit organization providing individual and couples counselling to diverse adults in Greater Vancouver. She led workshops for couples and parents, and facilitated women’s groups while volunteering for Battered Women’s Support Services. She also did extensive work with women dealing with domestic violence. Her graduate research focused on the benefits of attending couples counselling prior to marriage. I’ve been studying the way humans think and behave for close to a decade! Having had one too many encounters with heartbreak, loss, anxiety, depression –you name it, I was determined to know how to have a more fulfilling life and relationships. Along the way I learnt a lot about unhealthy relationships, trauma, anxiety, depression, and other blocks to fulfillment and growth. Through counselling and personal learning, I was able to work through old baggage, get a handle on my anxiety, and have healthy relationships with myself and others. My experience as a counsellor and as a person has shown me firsthand that you can change your life for the better. I’m excited to work alongside you to help you create a life that fulfills you. I’m passionate about what’s possible. I believe that no matter what your challenges are you can change your life and relationships for the better. My goal is to give you a positive counselling experience that makes you feel deeply cared for and understood. Together, we can explore what’s possible so that you can have a rich and meaningful life that’s truly your own. I use researched methods to help you get the best results. These include Person Centered, Solution Focused, CBT, EMDR, EFT and the Gottman Method. Person Centered: You’re in the driver’s seat -that means that I’ll be working alongside you instead of directing you on what to do. My role will be to facilitate your growth so you can get to your own answers and solutions by accessing your inner strengths and knowledge. Solution Focused: We will identify and work through any roadblocks that may be getting in the way of you living the way you want to be. Together we will set goals and come up with practical solutions that you can achieve. CBT: This involves challenging beliefs, thoughts and behaviours that are no longer working in your favour. Together we will come up with new beliefs, thoughts, and behaviours that lead to more self-compassion and healthier outcomes. EMDR: EMDR is a highly powerful approach to treating trauma, anxiety and depression. It involves targeting distressing memories through a series of eye movements. It is proven to significantly reduce negative feelings and beliefs connected to past events. Emotion-Focused Therapy: EFT focuses on creating safety and connection between partners. It does so by identifying negative patterns of interaction and by addressing the unmet needs that often underlie them. Gottman-Method: The Gottman-Method uses researched interventions to help couples have happy and healthy marriages. It’s goals include increasing closeness, addressing conflict and creating shared meaning.